the lilly: the amateur yogini. mr.cerewet show me this video early in august this year. amaze with the video, i secretly downloaded it from youtube and watch it repeatedly a few times. i was born with negative flexibility. i can't even touch my finger to my toes! my finger are like 10cm away from my toes no matter how hard i try pushing my body to reach it. i remember my family (mother,father and my sisters) are trying to push my back to make me touch my toes when i am in form 3 because they just can't believe how stiff i am!!!!!! back in form 3, the PJK teacher asked us to do some flexibility test and i got negative marks! but with the help of my classmate (can you imagine the whole class trying to push my back?) i manage to get - 2! that's why i never think of involving myself into any activity that require flexibility. i didn't even know what is the different between YOGA and GYMNASTIC! worst, i never know that YOGA originally from INDIA! but, after a deep thought and some encouragement from the video above, i decided to give it a try. i did think about getting a yoga class but then i am working and i know i will never have to time to go yoga class and i am also trying to save some money. plus, everything on google sudah bah sekarang kan, so, i finally decided to learn yoga by myself. i began to google about yoga, watch more yoga video and download many apps about yoga in my phone. *i love using the DAILYYOGA apps. really good for beginner and it's free! i actually started to go jogging a month before i started my yoga practise to reduce body weight. so, after jog, i'll do yoga at home. nothing comes easy at first. i have bodyache for 3 days after my first practise. and i didn't feel any changes in my body. 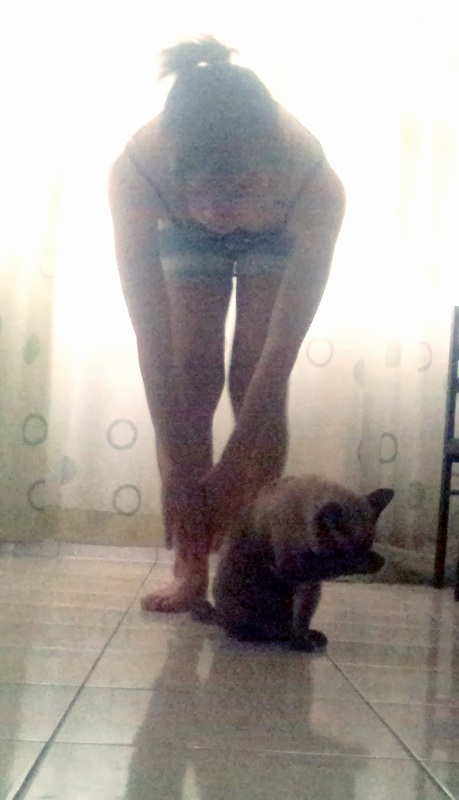 this is the first time i practise yoga. as you can see the picture above, that's the nearest i can reach when i first started yoga! what i didn't realize is that my flexibility was actually improving as i practise! there was one time, i was sitting with mr.CEREWET and he's teasing me as usual. "macam tiada perubahan jak tu yoga ko tu"
"bah, jadi mana? kasi tingu!" i try touching my toes and accidently touched it! at that time, saya sendiri pun actually really surprised tapi sebab i don't want to show that it's actually my first time touching my toes infront of mr.cerewet so, saya buat selamba ja konon. KEEP CALM AND KEEP LYING. 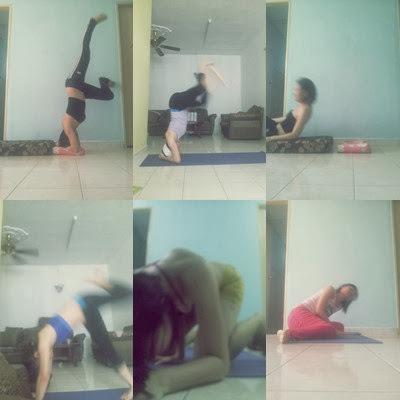 after that, i was so excited to do yoga practice everyday! yoga surprise me many times. it really taught me not to underestimate my body and love my body. my friend kieko gave me a yogamat as a present for my 24th birthday(tua!). first time doing headstand off the bed. 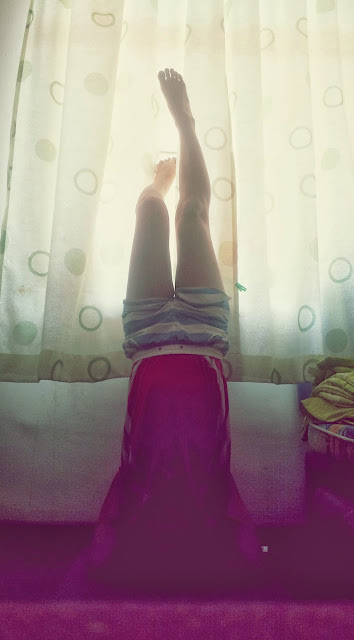 i was lucky because even if i didn't born flexible but i think i'm good in balancing (thanks God for that). 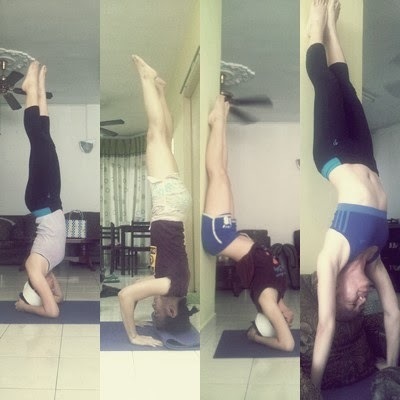 i learn headstand 2 weeks after i practice yoga daily continuously. and it took me 3 days to get off the wall. yoga is more fun if you join other yogini! 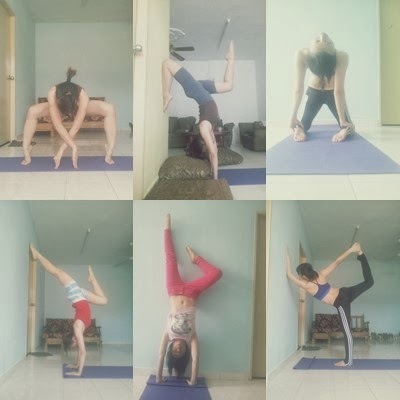 there re many yoga activity you can participate on IG! local one is #yogawithsabahan group. they did a yoga pose competition sometimes too! plus you'll get to know more yogini and they'll give you the tips of practising yoga and also how to improve yoga! 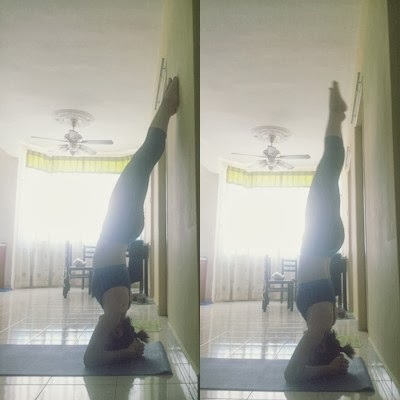 first time headstand off the wall. i manage to get off the wall for the first time for like only 3 second! and more coming headstand, tripod, handstand pose. And the next headstand and practise. 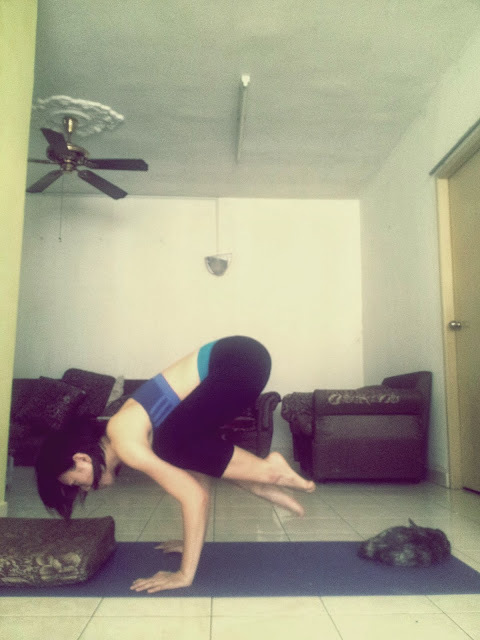 the first time doing the crane pose. and of course i fell. like sooo many times! i got bruises all over my leg and thigh too. but no pain no gain right? if i don't fall then i'll never learn! however safety first. do prepare blanket or cushion beside you if you are not confident enough to do it alone and make sure to do it near the wall! and do not go beyond your limit. if you're body are super duper stiff like mine, then you have to be patience. listen to your body and it'll follow your order! one of the reason why i love yoga is that my lifestyle also change! usually if i am working AM shift, i'll sleep in the afternoon from 3 pm until 6 pm and then stay up until 3 in the morning and if PM shift i'll wake up at 11 am. but since i need to go jogging and practise yoga, so, i 'll have to wake up early at 7 am. go jogging and at 8 pm until 9.15 am i'll practise yoga. and then i still need to cook vege (healthy eating also help me losing my weight!). done eating maybe at 11am. rest for 1 hour and then take my bath go to work at 1.30 pm. and tired with my busy schedule i'll automatically sleep at 12 am or before! no more late night wake up! there's still so many yoga pose that i can't do. and i hope i'll be able to do it soon! just because it doesn't happen today doesn't mean it will never happen! i update everything about my yoga progression on my IG. 'sherylilie'. you may come visit it. now i need my beauty sleep. hahaha. nti la sy try lg. try wat yg basic2 dulu. siok ow tgk org yg terer2 buat. jeles. hihihihi. I did yoga when I was at college.I think i fall sick for almost a week after that. But Yoga really help me to lose weight. I guess I need to start Yoga again...holycrap,starting always the hardest part.